He got plenty of negative media scrutiny (as a teen, he was a member of an infamous hacking group, he was held up as an example of white male privilege, and he got the Maureen Dowd treatment). Oh, and he also got in a 5K run, per NBC's Alex Seitz-Wald. We told you right after he announced that we'd find out relatively soon if O'Rourke was going to be a boom or a bust. Well, 96 hours later, it sure like more of the former than the latter — especially with that money haul. 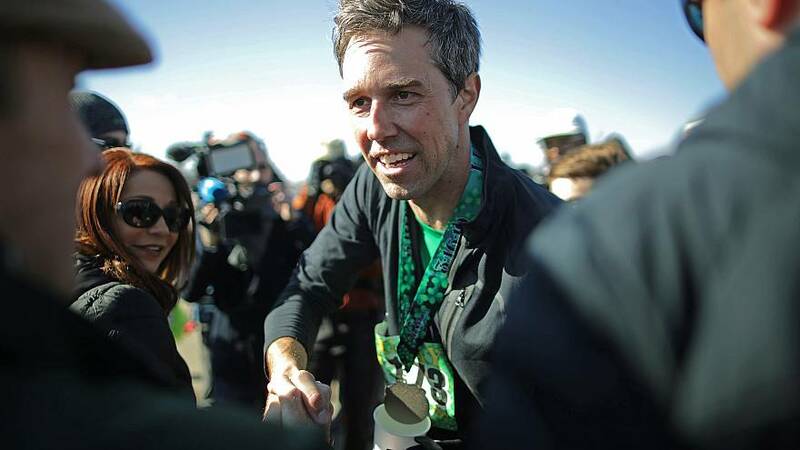 But remember, money and crowds were always O'Rourke's expected strengths. If he's going to win the Dem nomination - and we have more than 300 days to go before the Iowa caucuses! - he's also got to work on his shortcomings (policy, thin resume, questions about his past). Call it President Trump's St. Patrick's Day tweetstorm, as NBC's Kristen Welker put it on "Today" this morning. The New York Times says Crown Prince Mohammed bin Salman of Saudi Arabia authorized a campaign against dissenters more than a year before Jamal Khashoggi's killing. And it included surveillance, kidnapping, detention and torture. "At least some of the clandestine missions were carried out by members of the same team that killed and dismembered Mr. Khashoggi in Istanbul in October, suggesting that his killing was a particularly egregious part of a wider campaign to silence Saudi dissidents, according to the officials and associates of some of the Saudi victims." And: "Members of the team that killed Mr. Khashoggi, which American officials called the Saudi Rapid Intervention Group, were involved in at least a dozen operations starting in 2017, the officials said." After launching her exploratory committee two months ago, Sen. Kirsten Gillibrand, D-N.Y., made her campaign for president official Sunday by releasing a new video saying she's running for the White House to make "big, bold, brave choices," NBC News reported. Gillibrand, in Michigan, will participate in a town hall with MSNBC's Chris Hayes that will air tonight at 8:00 pm ET. Meanwhile, on Saturday, Joe Biden nearly declared his candidacy with the slip of a tongue, NBC's Mike Memoli noted. "I have the most progressive record of anybody running," Biden said, before correcting himself: "I didn't mean it. Of anybody who would run!" Beto O'Rourke campaigns in Ohio… Elizabeth Warren stumps in Mississippi… Julian Castro is in New Hampshire… And Gillibrand is in Michigan. That's the amount of money Beto O'Rourke's campaign said he raised in his first 24 hours as a candidate (though we don't have a number of actual donors). Bernie Sanders raised $5.9 million in his first 24 hours. Kamala Harris raised $1.5 million in her first 24 hours. Amy Klobuchar raised $1 million in her first 48 hours. John Hickenlooper raised $1 million in his first 48 hours. Jay Inslee raised $1 million-plus in his first 72 hours. And Elizabeth Warren raised $300,000 via her ActBlue account in her first 24 hours (but that doesn't represent total fundraising). Don't miss the pod from Friday, when we looked at the Republicans who broke from Trump on his emergency declaration, as well as the Senate GOPers up for re-election in 2020 who stood by him. Federal agents raided Elliott Broidy's office last summer, ProPublica reports. Ilhan Omar has a new op-ed outlining her vision of an "inclusive foreign policy." Democrats say they'll bring down health care costs. The question is: how? 2020 Democrats are flirting with the idea of expanding the Supreme Court. Nonprofits around the country are bracing for a dip in donations as millions realize they no longer have a financial incentive to give because of GOP tax reform. Ta-Nehisi Coates is weighing in on the 2020 contenders. Trump agenda: "The president is not a white supremacist"
Mick Mulvaney over the weekend: "The president is not a white supremacist. I'm not sure how many times we have to say that." The Washington Post notes how — after the Ethiopian Airlines crash — Trump took on a job usually reserved for the FAA. More lawyers and a reporter have been stopped and questioned at the U.S. border in recent months. Trump is going after John McCain yet again. Trump is weighing in on the closure of a GM plant in Ohio. Gillibrand will hold an event in front of Trump's NYC hotel. What's the deal with Andrew Yang? Amy Klobuchar says that the threat from white supremacists should be treated like "other forms of terrorism." Joe Biden has been doing well financially since leaving the White House. The Washington Post has a deep dive on how Beto O'Rourke decided to run for president.